Earlier this month, I introduced Vibes and Scribes, the official home of Mr. Fresh and the Sunday Soundtrack Podcast, by sharing a link to Mr. Fresh’s very comprehensive review of a recent Incognito concert (click HERE for his review). Well he has certainly taken his Incognito tribute to the next level, with an amazing interview with Jean Paul “Bluey” Maunick, leader of this awesome British Soul Jazz Funk band. There was so much musical wisdom being shared, I had to listen to it twice! I was introduced to Incognito in my college years, after having heard them on my then-favorite Smooth Jazz station, CD-101.9. Now offering their 15th studio album release Surreal, the collective is on a European/Asian tour for the rest of the year. Mr. Fresh caught up with Bluey Maunick during a tour break and had a great one on one session with this music genius. It was more of a conversation than an actual interview (the BEST kind of ‘interview,’ in my opinion!). I listened, feeling as if I were sitting at the feet of two cool musicians chewing the fat about their craft, the music industry and the genius behind Incognito. An interesting point was made about the universality of their music. 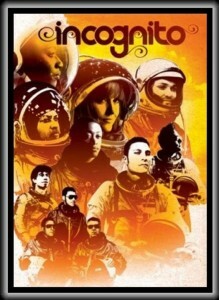 The sounds of Incognito range from jazz to soul to funk to almost any genre you can imagine. As music is a universal language, it’s great to see that their international, cross-genre vibe allows a wider audience to enjoy their music. Their sound may vary from project to project, but they don’t ‘reinvent’ themselves – they merely expand their aura, incorporating other artists into the Incognito sound. But let me not give away the interview…click HERE to hear the audio of Mr. Fresh’s conversation with the legendary Bluey Maunick!